Brandon Moss | Pittsburgh Lumber Co.
Pirate fans have mostly supported adding a second-rate free agent to team with Garrett Jones in covering the right field/first base spots. Even Frank Coonelly got in on the fun, with Rick Ankiel’s name coming up specifically. It seems like a harmless idea, seeing as the Pirates do not have many inspiring options for those positions. However, contrary to popular belief, adding a marginal player through free agency would do anywhere from very little to nothing to help the team win. Here is a list made up mostly of available, middling, corner-type free agents that the Pirates have some realistic shot at signing. I have included their 2010 CHONE projections, available at FanGraphs. As you can see, I included Brandon Moss and John Raynor on the list. Anyone else having a hard time distinguishing their projected numbers from the others? The Pirates already have an overflowing bench. I cannot see why we should add another player to the mix, particularly one that is projected to perform no better than Moss and only marginally better than Raynor. Both Moss and Raynor are 26 years old, cheap and possess some sort of upside. None of these options can say the same. But if the Pirates sign any of these players, Moss and/or Raynor will be out the door. It just does not make sense to me. I’ll take a win, no matter how unorthodox. Jeff Karstens, coming off the DL and having not thrown more than 60 pitches in a game since his last start in June, started and was on a quick hook. He pitched three mostly effective innings (one run and three hits), but was pulled after 48 pitches. In his place came Donnie Veal at the best of times. The Bucs were up and the starter hadn’t gone five. Thanks to two scoreless innings from Veal and shutout efforts from three others – including a perfect 9th from Matt Capps – Veal picked up his first career W.
The Pirates scored three unearned runs off Jon Garland. Blake DeWitt’s error in the first led to a sac fly from Garrett Jones. James Loney’s miscue in the third set up a two run, two out single from Brandon Moss. Garland went six, gave up three unearned runs and whiffes six. He allowed six hits – five singles and a double. Good pitching. Pirate starters walked none! Last time the Pirates won a game in which the starter didn’t pitch five innings was 7-22-09 when Paul Maholm left after 4-2/3 in an 8-7 win over Milwaukee. There are only four players in the Majors right now under the age of 30 with more than 100 career wins. Jon Garland is one of them. The others are Josh Beckett, C.C. Sabathia and Carlos Zambrano. Moss has had three different two RBI games in September – his most of any month this year. Last time the Pirates walked zero hitters in a game was August 22nd against Cincinnati. Rajai Davis was in Sports Illustrated this week. Got me thinking – I hadn’t looked up his numbers in a while. So, how is the Rajai Davis Phenomenon doing? Let’s just say he is clearly having a better season than Moss is. Not really even close. 10 games left. Pirates need to go 6-4 to avoid 100 losses. It was one bad inning that did in Charlie Morton. That inning was the third and the Red scored four times and collected four of their seven hits for the game. Joey Votto’s two run double did the most damage. Morton allowed just two other hits in his seven innings of toil. But the Pirates managed only a solo jack from Lastings Milledge off of Bronson Arroyo. The ex-Bucco also lasted seven, scattering five hits and whiffing four. The Pirates put three runners on against Francisco Cordero in the 9th, but were unable to score. Nothing. Maybe Morton wasn’t so bad other than that one inning. Three double plays from the defense, including an OF assist from Brandon Moss. The continuing saga of the pathetic offense. Welcome G20 summit attendees and protesters! Arroyo moves to 4-3 in his career against Pittsburgh. He picked up his second win of 2009 with no defeats against the Pirates. This was Arroyo’s 76th win since being let go by the Pirates. Only four pitchers have logged 200 or more innings in each of the past five years – Arroyo, Mark Buehrle, Danny Haren and Javier Vazquez. As it stand right now, the Pirates have amassed just four such pitcher seasons over the same period. I don’t want to go out on a limb, but I think it was officiallly a mistake to let him walk. After hitting 14 homers in 587 ABs in 2008, Milledge has just three in 179 ABs in 2009. It was a nice comeback and it was good to see some fight in the fellas. The Pirates scored three in the 8th and one in the 9th to send the game to extra innings. But Jeff Karstens was torched for five runs in the extra frame as San Diego took 3 of 4. Daniel McCutchen (6 IP, 8 hits, three runs, zero whiffs) was on the hook for the loss. Until Luke Gregerson gave up three runs in the 8th and Heath Bell uncharacteristically blew a 9th inning save. That took away a win from rookie Wade LeBlanc (5 IP, 5 hits, one run, five strike outs). It was a 3-2 game coming into the 8th. But Chase Headley (solo) and Nick Hundley (two run) hit homers off of Jesse Chavez to push the lead to four runs. But Andrew McCutchen’s two run double off of Gregerson keyed the 8th inning rally. The Pirates loaded the bases with no one out in the 9th off of Bell, but managed just the tying run. Headley’s RBI double in the 11th opened the scoring in that frame and was his fifth hit of the game. That outburst made a winner of Sean Gallagher. Garrett Jones hit his 20th homer. Only getting one run off of Heath Bell in the 9th. That was the 9th time this year that Headley has had three or more hits. It was his first three double game in his career. Combined Andy LaRoche and Brandon Moss only have six games with three or more hits. Phil Dumatrait tossed a scoreless inning of relief. He has been scored on in six of his 11 appearances. Adrian Gonzalez drove in two runs to reach 92 RBI. He is trying to become the first Padre ever to knock in 100 runs in three straight seasons. Only one other Padre – Phil Nevin – recorded three different 100 RBI seasons. Charlie Morton allowed a first inning run and then no more over seven strong innings. He gave up six hits (four in the first two innings) and just one free pass, while striking out four. 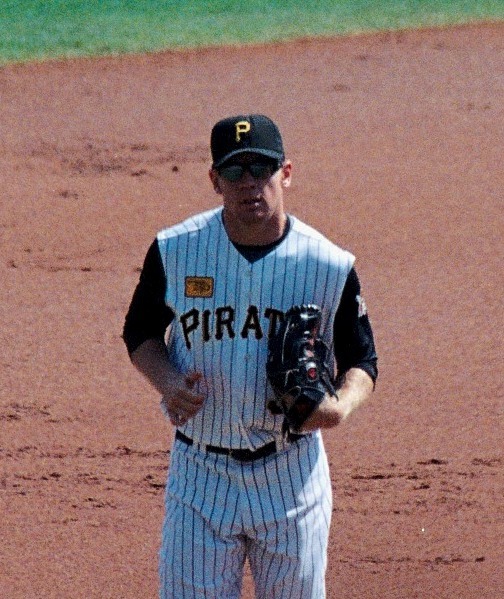 The Pirates battled back early off of a wild Tim Stauffer. With the aid of four walks and a pair of triples, the Pirates scored three times in the first and never looked back. Brandon Moss’ two run triple was the big hit. After that it was Morton. Stauffer was pulled after three, allowing the three runs on four hits and four walks. Jesse Chavez and Matt Capps each tossed a scoreless inning to end it. This was Morton’s first win since August 21 against Pittsburgh. In his next start, he was clobbered for 10 runs against the Cubs. This was his best start since he threw seven shutout innings against San Francisco in July. Brandon Moss is statistically at least, having an awful year for a corner outfielder. Looking back at Pirate players that had 350 or more plate appearances and failed to drive in 40 runs, you have a collection of lead off hitters and middle infielders. Other than Andy Van Slyke’s disastrous final season in Pittsburgh, the list is populated with names like Jose Castillo, Abraham Nunez, Lou Collier, Mike Benjamin, Jacob Brumfield.